Note the reddish swellings or galls on these peach leaves. OSU Extension Plant Pathology Slide Collection, 1976. 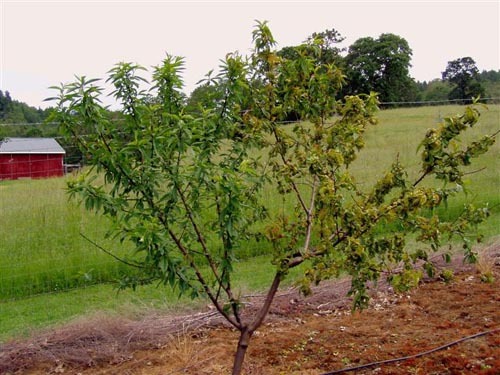 This is a peach tree grafted with two curl resistant cultivars. Cultivar 'Q 1-8' on the left and the cultivar 'Mary Jane' (with lots of curl) on the right. Photo by Ed Hoffman, 2003. Without fungicide protection, susceptible trees defoliate in the spring and may die after the next winter. Sometimes western Oregon can have weather for peach leaf curl well after bud break. Sometimes called late curl or secondary curl. Note that the oldest and newest leaves do not have curl symptoms. Damage is not considered as severe as curl that occurs at bud break. Cause Taphrina deformans, a fungus. Spores of this fungus overwinter on bark, twigs, and old infected leaves. 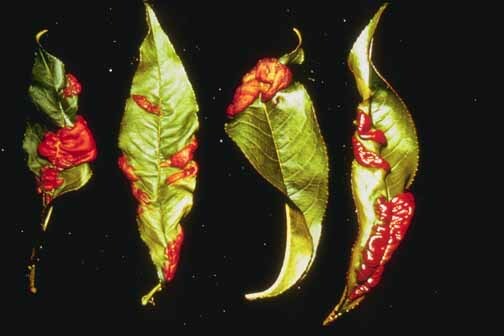 Infection occurs through bud scales in mid- to late winter just as buds begin to swell. Slow growing shoots and leaves can be infected during cool and wet growing seasons. Maximum susceptibility is between bud break and petal fall. In wet seasons, the fungus continues to cause slight summer infection, particularly west of the Cascade Range. 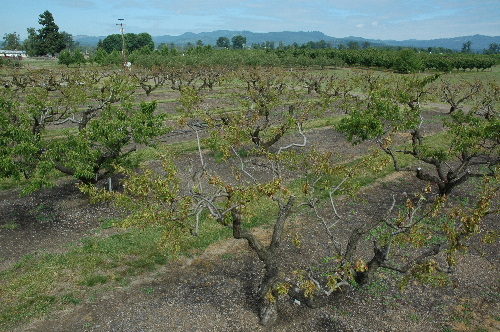 East of the Cascade Range, after the initial spring infection and the shedding of diseased leaves, no further evidence of the disease is visible. Photosynthetic function of infected leaves is reduced, the leaf imports sugars, and the contents of non-structural carbohydrates and enzymes involved in their metabolism are similar to sink leaves. Defoliation from severe infections weakens trees to the point that, if not controlled, they may die in 2 to 3 years. Wetness from rain (or other factors) for over 12.5 hours is needed for leaf infection but only when the temperature is below 61°F during the wet period. Maximum infection occurs when trees are wet for 2 days or more, a frequent occurrence west of the Cascade Range. Although infected, symptoms may not appear if temperatures rise and remain above 69°F. Fruit are susceptible after petal fall until air temperature remains above 61°F. Rainfall of 0.5 inch and wetness of 24 hours is needed for fruit infection. Symptoms The first visibly infected leaves are yellow to reddish and somewhat thickened and crisp in texture. As leaves expand they become deformed, puckered, and thicker than normal. The puckered areas are brightly colored with reds and/or purples and may continue to develop a dusty white coating of spores. 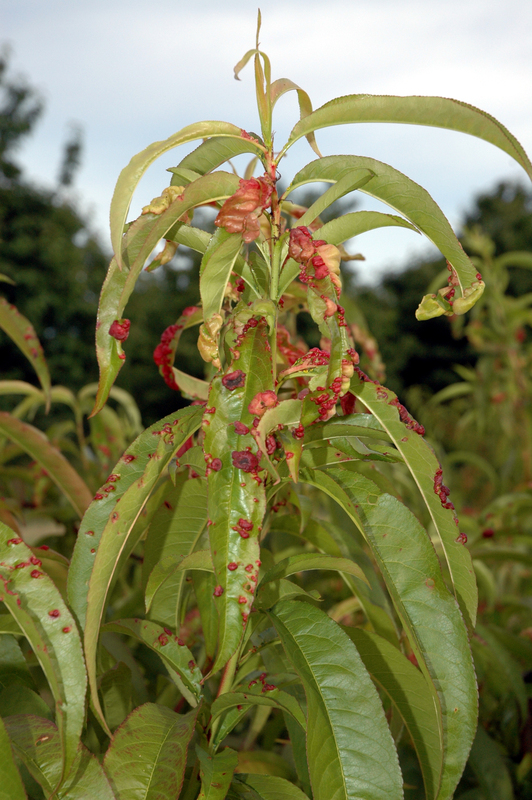 Infected twigs occasionally are distorted, and a few fruit may show a reddish growth on the surface. Some infected leaves drop; others remain throughout the growing season, gradually becoming dark brown and heavily coated with spores. Ultimately, many infected leaves are shed. Trees die in 2 to 3 years from repeated defoliation. Cultural control Resistant cultivars offer the best option for backyard growers and can be useful for commercial growers. Cultivars available today are selections from formal and informal breeding programs, chance discoveries by various growers, or propagated from trees planted by pioneers which have survived for decades. Many of these will do better if sprayed with fungicide the first year or two after planting. Trees may still die due to other problems such as shothole and/or bacterial canker. A report from North Carolina in 1981 found Redhaven and trees derived from Redhaven as tolerant but these trees are very susceptible in the PNW. The following peach or nectarine cultivars are offered by a variety of west coast nurseries as curl resistant: Autumn Rose, August Etter, Avalon, Avalon Pride, Charlotte, Early Charlotte, Early Crawford, Frost, Indian Free, Kreibich, Muir, Nanaimo, Oregon Curl Free, and Q-1-8. Chemical control Two fungicide applications are recommended for western Oregon: at 50% leaf fall (late October), and again at delayed dormant (usually in late February, before floral buds open). A third application may be needed during the dormant season for shothole control depending on materials selected. In Washington, apply three (3) times 3 weeks apart starting in early January. East of the Cascade Range and in low rainfall areas, a delayed dormant application alone should be effective. Bravo Weather Stik at 3 to 4.1 pints/A. Group M5 fungicide. 12-hr reentry. Champ WG at 8 to 16 lb/A. 48-hr reentry. C-O-C-S WDG at 12 to 15.6 lb/A. 48-hr reentry. Copper-Count-N at 8 to 12 quarts/A. Oregon only. 48-hr reentry. Cuprofix Ultra 40 Disperss at 5 to 10 lb/A. 48-hr reentry. Kocide 3000 at 3.5 to 7 lb/A. Use the highest rate in western regions. 48-hr reentry. Nordox 75 WG at 5 to 13 lb/A. 12-hr reentry. Nu-Cop 50 DF at 8 to 16 lb/A with 1 pint superior-type oil/100 gal water. 48-hr reentry. Echo 720 at 3.1 to 4.1 pints/A. Group M5 fungicide. 12-hr reentry. Ferbam Granuflo at 4.5 lb/A. Do not apply within 21 days of harvest. Group M3 fungicide. 24-hr reentry. Luna Sensation at 5 to 7.6 fl oz/A. Do not use within 1 day of harvest. Unknown efficacy in the PNW. Group 7 + 11 fungicide. 12-hr reentry. Syllit FL at 3 pints/A. Group U12 fungicide. 48-hr reentry. Thiram Granuflo at 3.5 lb/A. Do not apply within 7 days of harvest. Also serves as an animal repellent. 24-hr reentry. Ziram 76 DF at 6 to 10 lb/A. Rated excellent. Group M3 fungicide. 48-hr reentry. References Moscatello, S., Proietti, S., Buonaurio, R., Famiani, F., Raggi, V., Walker, R.P., and Battistelli, A. 2017. Peach leaf curl disease shifts sugar metabolism in severely infected leaves from source to sink. Plant Physiology and Biochemistry 112:9-18. Rossi, V., Bolognesi, M., and Giosuè, S. 2007. Influence of weather conditions on infection of peach fruit by Taphrina deformans. Phytopathology 97:1625-1633.